Confidence – When I am feeling confident, I am bold, not timid. Freedom – When I am experiencing freedom, I am bold because there’s nothing that is hindering me from being so. Security – When I am feeling secure, I can make bold moves instead of playing it safe. Being loved – When I know I am loved and will be loved even if I fail, I can step out in boldness, not being limited by any fear of what others will think. Having hope – When I have hope, I can climb mountains that are otherwise too overwhelming. All of these things are found in faith. All of these things are results of a faith-filled heart. Boldness – holy boldness – comes from a faith-filled heart, and it is the difference between timidly attempting the assignments God has given me and boldly attacking the assignments He has designed for my life. All these conditions come from our faith in Christ. 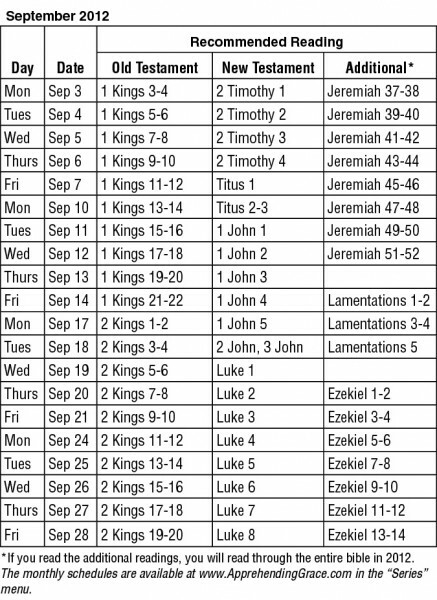 Let’s look at Scriptures that relate to each. Since this new way [that is, faith in Christ] gives us such confidence, we can be very bold. He gave himself for us to set us free from every sin and to cleanse us so that we can be his special people who are enthusiastic about doing good things. Security – Having security means I am not worried about what will happen to me; I’m not to take action. 2He sang: “The LORD is my rock, my fortress, and my savior; 3my God is my rock, in whom I find protection. He is my shield, the power that saves me, and my place of safety. He is my refuge, my savior, the one who saves me from violence. Being loved – Knowing that we are loved brings the greatest freedom and in turn, the greatest boldness. It is what causes us to run freely in the wind and fiercely into battle. But God showed [demonstrated] his great love for us by sending Christ to die for us while we were still sinners. Having hope – Hope gives us reason to look forward – reason to live boldly today because of what awaits us tomorrow. 18So God has given both his promise and his oath. These two things are unchangeable because it is impossible for God to lie. Therefore, we who have fled to him for refuge can have great confidence as we hold to the hope that lies before us.19This hope is a strong and trustworthy anchor for our souls. It leads us through the curtain into God’s inner sanctuary. Faith in Christ is the key to conditions of the heart that lead to a holy boldness. Fatalism – When I believe that “whatever is supposed to happen will happen,” I am less careful about where I step and the path I take. Fatalism is a lie from the enemy. Scripture is clear that we have personal responsibility to pursue God, to choose to obey Him by taking the actions He assigns to us, not waiting to see what will happen and trusting it has been His will. Utter sense of futility – When “who cares” and “what difference does it make” are phrases that have captured my mind and heart, I either fall into the depression of nothingness or take rash action. Of course these phrases are also whispers from the enemy. They are signs that he has been on the prowl, seeking someone to devour (1 Peter 5:8). He’s trying to devour you. God cares and He has purposes for your life that reach into eternity. Rebellion – When I’ve become tired of following my King and decide to go my own way and make my own decisions, all of my actions can be labeled reckless boldness. We can’t blame the enemy on this. This is sin. It is our own selfish pride. It is thinking we have a better plan than God. It requires repentance – a genuine sorrow for our attitudes and actions, a turning to God for forgiveness and a change in our behavior and thoughts. Disappointment with God – When God doesn’t live up to our expectations (oh, Lord, it is difficult for me to even write this, but I know there are time when we feel like this – forgive us when You are so worthy of our worship even when we feel disappointed) – when God doesn’t live up to our expectations, our hearts can grow cold. Our minds build a case against Him and our attitudes turn to rebellion. Being disappointed with God doesn’t have an easy solution – it’s usually a combination of repentance for our own wrong attitudes with a heavy dose of experiencing God’s great love. It requires an understanding that God’s plan is greater than our earthly desires. The antidote to all of these conditions that lead to reckless boldness is faith. A faith-filled heart is the greatest weapon against these conditions. A faith-filled heart is the greatest weapon against reckless boldness. That faith comes from being with Jesus. We see it again and again in the New Testament. Because the men had been with Jesus, they had a holy boldness that confounded the leaders. We can have that same holy boldness. And so, dear brothers and sisters, we can boldly enter heaven’s Most Holy Place because of the blood of Jesus. Our faith-filled heart enables us to fulfill God’s purposes in our lives – it gives us the holy boldness we would otherwise lack and it keeps us from acting recklessly, without caution or care. 16I pray that out of his glorious riches he may strengthen you with power through his Spirit in your inner being, 17so that Christ may dwell in your hearts through faith. And I pray that you, being rooted and established in love, 18may have power, together with all the saints, to grasp how wide and long and high and deep is the love of Christ, 19and to know this love that surpasses knowledge – that you may be filled to the measure of all the fullness of God. I can’t pray it any better. Knowing the vastness of God’s love for you, may you be filled to the “measure of all the fullness of God.” Whew! That’s gonna lead to some holy boldness! 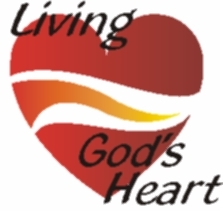 If this blog has blessed you or helped you live in holy boldness, please share it with others. You can use one of the buttons below to share. Let’s help one another become a people worthy of God’s calling (Ephesians 4:1). Death is such an affront to us. It’s a slap in the face even when it is expected. When unexpected it’s a punch in the gut. Actually, it’s a punch in the gut even when it’s expected. God didn’t intend it to be this way. And He makes it possible for death to be only a temporary separation from our loved ones. For those who accept Christ as their Savior, death is simply an entry way into the full presence of God and His eternal Kingdom. When faced with death I am reminded that God uses all things – even death – for His purposes. Several things become clear to me when I meditate on the end of someone’s life. Life and death are in the hands of the Lord. That is sometimes a harsh reality, but it is a reality. We are often tempted to ask God why a loved one is taken from us. Often too young. Always too soon. I can’t answer those questions, but I am convinced that life and death are in His hands (Deuteronomy 32:39, 1 Corinthians 3:22). He determines the times and places we are to live (Acts 17:26) and He has our days numbered before we are born (Job 14:5). God is present at every death. Whenever it occurs – or perhaps I should say each and every time it occurs – each and every time someone dies, God is there. I don’t have lots of answers but I know my God and I know His compassion and I know that the One who values life so much that He knows the number of hairs on each person’s head (Matthew 10:30) and the One who loved each one of us so much that He willingly died for us (Galatians 1:4, Titus 2:6, 1 John 3:16) – that God is present at the point of death. He grieves over sin if the death is untimely, but He is there for the dying. He is even there for the dying one who has spent a lifetime denying His existence. He gives them one last chance to recognize the reality of the One True God and submit their life into His hands. I’ve come to the conclusion that there is some kind of spiritual connection among the living and when someone dies that connection is broken. When Phil’s mom died, he came up with this analogy: when a computer network is turned on, the system is always sending out impulses to other computers, checking to see if they are still connected. This is called “pinging” and it’s a continuous process. Without us being aware of it, it seems that our spirits “ping” for the spirits of those we love constantly and we receive an unconscious knowing that they are there. When someone dies, that ping goes out from us but is not returned. At an unconscious level there is a brokenness, a void, a missing connection that pushes itself into our consciousness and alerts our brain that “something is very wrong here.” Our brain then transmits that information to our emotions. The wonder of a newborn. The awesome creative power of God given to humans enabling us to create life. The instant and intense love that binds the newborn to his parents. The crash of death. Reminding us that life has its limits that we cannot outwit, outlast or outplay. Reminding us that life is for the living and we ought not to waste time on petty, insignificant differences – or even the big ones. Life is for loving and bring glory to God. That’s the earthly side. There is a heavenly side for believers making it the most holy of holy days. It is the day in which we meet our Savior face to face. It is the day in which we worship as we’ve never worshiped before. It is the day of our true and final birth. Lord, death is hard. Help me to introduce others to you so that they may experience not only a second birth (John 3:3-7), but a final birth into Your heavenly kingdom. LORD, remind me how brief my time on earth will be. Remind me that my days are numbered — how fleeting my life is. 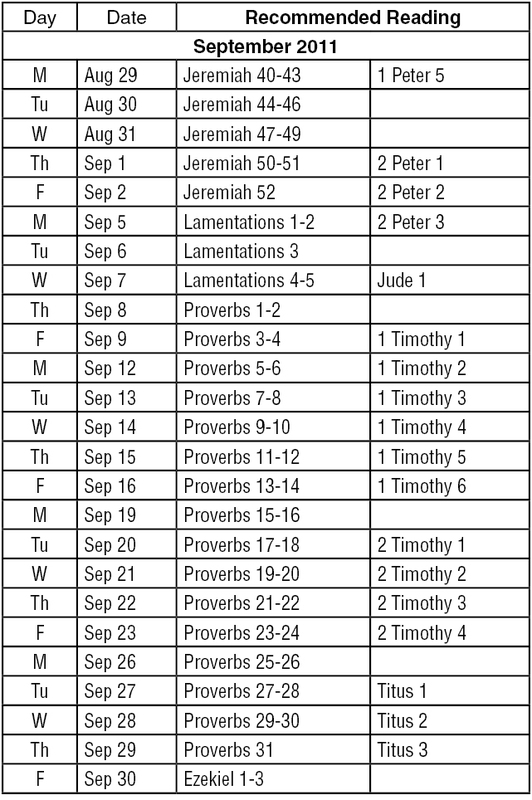 Track your reading along with us using the table below, the downloadable half-page PDF or the September/October Bookmark. September offers an opportunity to start anew as routines change with the changing weather. If your reading declined during the summer months, jump back in and join us. We’d love to have you share what God is teaching you. E-mail me, leave a message on the Apprehending Grace Facebook page, or post a comment at the end of any blog. 2for attaining wisdom and discipline; for understanding words of insight; 3for acquiring a disciplined and prudent life, doing what is right and just and fair; 4for giving prudence to the simple, knowledge and discretion to the young—5let the wise listen and add to their learning, and let the discerning get guidance—6for understanding proverbs and parables, the sayings and riddles of the wise. but he delights in men who are truthful. The situation became incredibly clear to me – did I want to please my boss and have the Lord detest my actions or bring delight to the Lord and displease my boss? Hands down, I wanted to please the Lord. I did and He honored those actions. Very soon thereafter I quit that position and stepped into a much better job. We’ll also spend a considerable amount of time in 1 and 2 Timothy and Titus. They seem an appropriate paring with Proverbs because they provide guidance about caring for and protecting the Church. The three letters focus on leadership qualifications and responsibilities as well as church life. 1 Timothy focuses on sound doctrine while 2 Timothy focuses on encouraging steadfast Christian living despite the circumstances we find ourselves in. The book of Titus carries a little of both topics. Here’s to being much wiser by the end of the month! 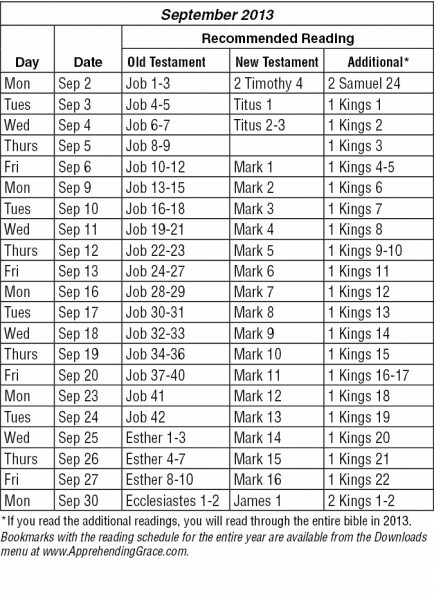 To download a PDF of the September 2011 recommended reading plan, click here. As spring develops, don’t lose focus on what’s important, but feel free to take your Bible and notebook outside and enjoy some spring weather!